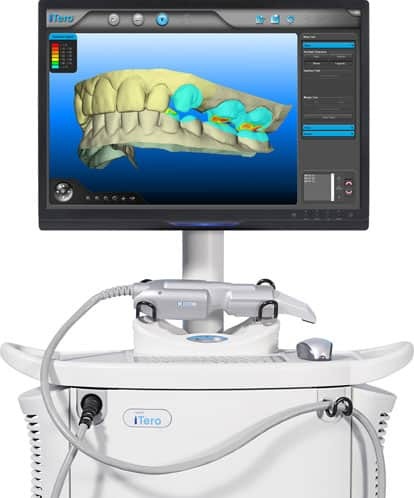 The iTero scanner is a cutting-edge digital instrument that provides for an accurate, comfortable alternative to traditional orthodontic impressions. Using radiation-free laser technology, iTero creates a digital model of the mouth, including bone structure and soft tissues. iTero leads the optical scanning market with its advanced treatment options, treatment simulations, and real-time adjustability. Maximum accuracy, unaffected by movement. Particularly, iTero scanners are involved in the production of Invisalign aligners. In contrast to traditional braces, Invisalign offers more comfort and more convenience for the wearer; there are no cumbersome brackets involved, and the aligners can be removed when necessary or directed. A perfect fit is especially crucial to achieving the best results and least amount of discomfort. iTero’s precision imaging is universally trusted for the task of designing an aligner that molds flawlessly to the patient’s teeth. Invisalign is only one corrective option among many that iTero makes possible. To learn more about dental solutions suitable for you, consult with Dr. Mike McDermott. His offices can be found in Brainerd, Baxter, Pequote Lakes, and Delano, Minnesota.